This fiscal year, we started an investigation on inau (equipment used for Ainu religious rituals) existing in Honshu and below. 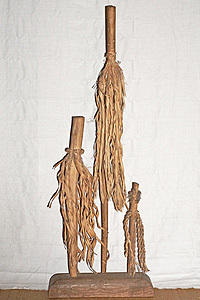 A large number of materials related to Ainu from the early-modern times to the Meiji era, which are believed to have been brought through the Northern Trade, were introduced to port towns on the Sea of Japan side, which once flourished as anchorage sites for kitamaebune trading boats. Among the materials, we found that inau dedicated to shrines or temples still exist in Ishikawa, Aomori and other prefectures, and we are currently investigating them together with Mr. Mikio Toma of the Ishikawa Prefectural Museum of History and Mr. Jirota Kitahara of the Center for Ainu & Indigenous Studies at Hokkaido University. In the investigation conducted so far, we have found four inau honogaku (votive tablets) with inscriptions showing years from 1887 to 1890 in the Monzenmachi district of Wajima, Ishikawa Prefecture, while one inau honogaku with an inscription of the first year of the Meiji era (1868) was found in Hakusan, the same prefecture. These tablets carry ink-written letters meaning such things as “dedication” or “maritime safety,” suggesting that they were dedicated by the owners of kitamaebune boats to a prayer for, or in appreciation of, a safe navigation. Meanwhile, in the town of Fukaura, Aomori Prefecture, which provided an important port for kitamaebune boats to wait for a good wind to sail, there are 27 inau, the years of which are unknown, implying that they were dedicated in relation to the belief in the sea. 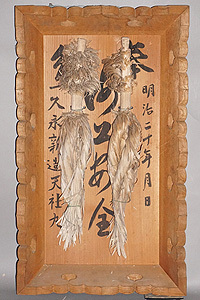 While these inau are not well known so far, they can be regarded as very valuable historical materials that are the oldest next to one believed to have been collected by Juzo Kondo in 1798, and those possessed by the Tokyo National Museum (1875) and by the Botanic Garden, Hokkaido University (1878). In addition, these historical materials suggest that the owners of kitamaebune boats carefully brought inau used for Ainu religious rituals back to Honshu and have been protecting them up to the present day by dedicating them to temples or shrines in their respective communities. In addition, it can be said that they are very suggestive materials reflecting the realities of exchanges between wajin and Ainu people through the Northern Trade. As there are possibly undiscovered inau in areas along the coast of the Sea of Japan, we will continue the investigation in cooperation with relevant institutions.